Register Log In ECN Forum Forums Photos for General Discussion Mast About to Leave Building! Here I go again, pointing out substandard work- in this case I think by the utility! The mast for the service is secure; the mast right next to it -cable company, I think- is about to go "bye bye." I was there for some interior work, but when I saw this I just had to add a support or two. It looks like the 'ashlar stonework' effect wallpaper is peeling off under the step ladder , which perched precariously on the fascia, is looking to go "bye bye" as well! PS- Where do you get those giant felt marker-pens?? That reminds me of one I often walk past: Mast is about sixteen feet long with six feet of it above the edge of the roof. 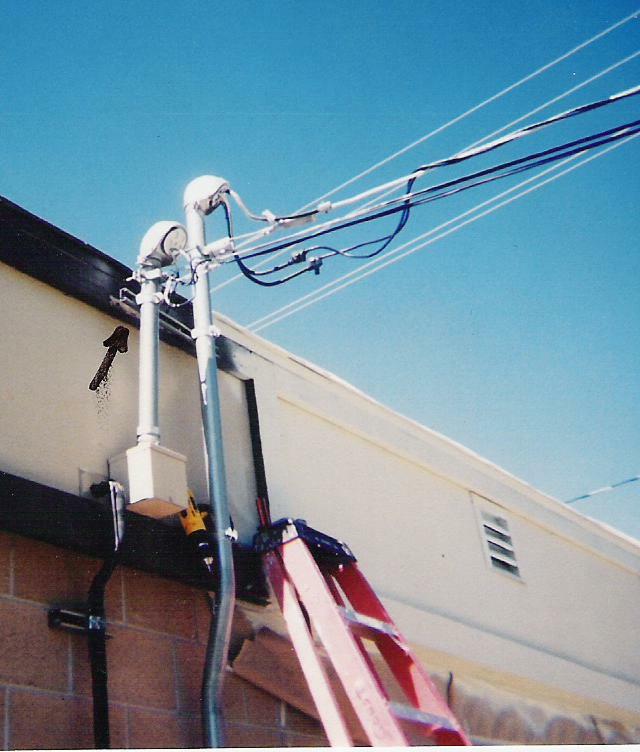 They needed two pieces of rigid, but instead of putting the six foot piece on the bottom going into the meter can, they put the six foot piece on the top and anchored the drop to it. Everything is nice and secure right up to the coupling where the mast makes a 20 degree bend because of all the stress on it. What sort of screw(s) were holding that clamp rail on?. Seems really strange how people expect fixings like this to stand up, with a messenger wire under tension as it's load. I personally would have used 2 heavy S/Steel saddles on each pipe, held down with coach-screws. Hehe, that's a good one!. I can't recall the exact screws used....but it seemed to me that the strut was once properly anchored with lag bolts, and centered on the service mast....then along came someone who re-positioned the strut so as to hold his pipe, and the lage were replaced with a small screw at that end (with the original lag still holding at the service mast). Or, since the building is made of stucco-covered block, the original anchors may have gone through the wood strip, and into the block. Also of note here is the use of a standard EMT fitting where the CATV enters the pull box. This would not be allowed for an electrical panel, and a "Myers hub" used instead. Among other differences, the Myers hub has a much larger flange, so the stress imposed by the pipe is spread over a much larger area. My fix...done 'on the house'....was to replace the pulled-out screw with one that worked together with an anchor in the block.